Enjoy the visual extremities of Lake Eyre, Australia's largest inland lake situated in South Australia. Its incredible colors and patterns become accentuated from the air whether full of water or totally dry on this 2hr flight. 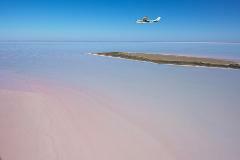 5 hour scenic flight from William Creek to Dalhousie Springs taking in Lake Eyre.